The Hangtyte Support/Suspension System is the first type of boat cover support we have offered that does not involve placing a pole under the cover to prop it up. This system is made specifically to work for boats that have towers. 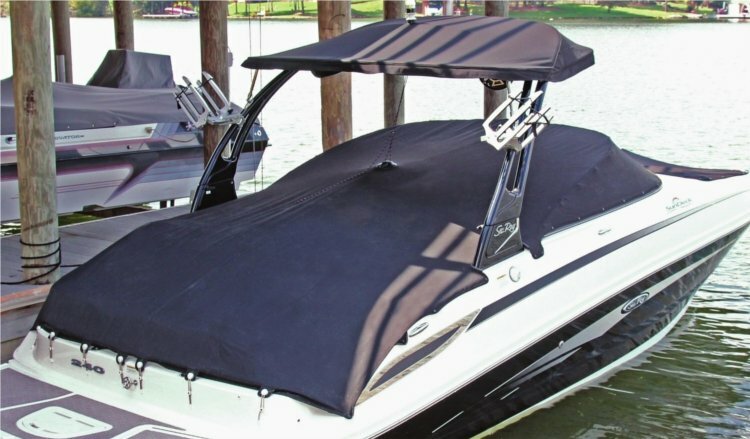 If you have a boat cover, you want to support it. The Hangtyte Suspension system will ensure that the cover is held taut, not allowing sagging or pooling water. A properly tied down and supported cover will allow water to run off with ease. Hangtyte makes it easy by eliminating the need for poles. No more crawling under the cover to get your poles positioned just right! You simply attach the system to the cover, hook the rope over the tower, and tighten it using the ratchet system. You don't have to worry about losing the system, because it will always be attached to the cover.